OBERNAI, France and AUSTIN, Texas – Jan. 8, 2018 – Hager Group and Silicon Labs (NASDAQ: SLAB) have collaborated to create a smart home platform that enables seamless connectivity for applications using multiple wireless standards including Bluetooth Low Energy (LE), KNX and Sigfox. 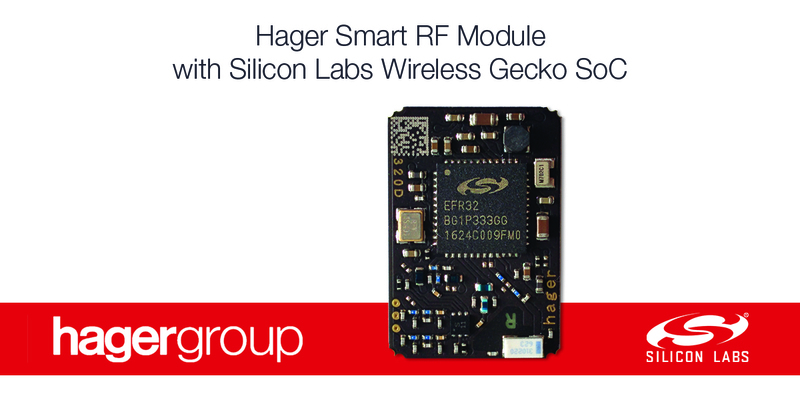 The new Hager Smart RF module incorporates Silicon Labs’ EFR32 Wireless Gecko system-on-chip (SoC) device to enable versatile, energy-efficient multiprotocol and multiband connectivity at 2.4 GHz, 868 MHz and 433 MHz. The tiny, stamp-sized Smart RF module is ideal for home automation, ambient assisted living and commercial building automation applications requiring excellent RF performance, ultra-low power, multiprotocol wireless connectivity, easy application development, and interoperability with IoT applications and smartphones. The flexible, feature-rich Wireless Gecko SoC enables the Hager module to continually adapt to changing automation needs and evolving software requirements through multiprotocol support and over-the-air updates. The Hager Smart RF module integrates all necessary elements for home and building automation applications and services that need 2.4 GHz Bluetooth LE connections, secure KNX RF communications in sub-GHz bands and Sigfox technology for low-power wide-area network (LPWAN) access. The module incorporates a high-performance ARM® Cortex®-M4 CPU, 512 kB flash (ample memory for software updates), a multiprotocol RF transceiver with -103.3 dBm sensitivity at 2.4 GHz, built-in hardware cryptographic acceleration for AES 128/256, SHA-1/2 and ECC, and a wide range of low-power peripherals and interfaces. The 20.285 mm x 14 mm x 2.1 mm module fits space-constrained IoT end node designs, and its low energy consumption (1.4 µA in deep sleep mode) makes it a good choice for power-sensitive systems requiring long battery life. Silicon Labs’ EFR32 Wireless Gecko portfolio is the most versatile, feature-rich multiprotocol, multiband platform available for the Internet of Things (IoT). The Wireless Gecko platform includes SoCs, modules, software stacks (Zigbee, Thread, Bluetooth® 5, Bluetooth mesh and proprietary protocols) and development tools that enable solutions for efficient switching among different wireless networks. Wireless Gecko supports a broad range of use cases for home and building automation, connected lighting and industrial IoT. Follow Silicon Labs at http://news.silabs.com/, at http://blog.silabs.com/, on Twitter at http://twitter.com/siliconlabs, on LinkedIn at www.linkedin.com/company/siliconlabs and on Facebook at http://www.facebook.com/siliconlabs. Follow Hager Group at www.hagergroup.com, on Twitter at http://twitter.com/hagergroup, on Linkedin at http://www.linkedin.com/company/hagergroup and on Facebook at http://www.facebook.com/hagergroup.